Watermelon recipes | 112 watermelon recipes. The juiciest and the most famous of all melons is the watermelon. A bright red oblong or round fruit with thick green rinds that are often spotted or striped and black seeds is now found all around the year. Indian's relish watermelon as it or with a sprinkle of chaat masala or black salt. You can toss them in salads or make delicious beverages. Watermelon is rich in Vitamin A and C. Moreover, this sweet and juicy fruit is also rich in carotenoids like lycopene, beta-carotene and others. Once cut, watermelon should be refrigerated to best preserve its freshness, taste and juiciness. So, you can keep the dressing ready and toss all the ingredients together just before serving. Watermelon, Pineapple and Paneer Salad and Watermelon and Mint Salad with a lemony honey dressing is refreshing and tastes best when served chilled. It’s a gift to mankind to help beat the hot summer sun! The combination of sweet watermelon and salty feta cheese works very well with each other. Try your hands on this popular combination of Watermelon, Orange and Feta Salad or Watermelon Feta Salad and enjoy the tantalizing colour and flavor. Toss together cubes of tangy pineapple, juicy watermelon and cucumber with an aromatic and flavorful dressing of ginger to create this delightful, tongue-tickling Mixed Fruit Salad in Ginger Dressing. Relish this Hawaiian Fruit Bowl, a visual delight that is rich in iron, fibre, vitamin c and fructose. Begin your morning with this plateful of nutrients. The Anti- Aging Breakfast Platter is not only appealing but also, appetizing! Watermelon is simply irresistible and a great thirst quencher. When combined with flavorful ingredients like basil, lemon, ginger, mint, various melons, etc. you can blend a myriad of mocktails and fruit juices. With the goodness of summer seasons popular White Jamun, you can blend together a beautiful Watermelon White Jamun Summer Cooler or a simple Watermelon Cooler with milk and soothe your body. Watermelon is rich in water and fiber, which makes it a perfectly heart-friendly, low-fat ingredient. It contains 91.45 g water per 100 g, an ideal ingredient for weight watchers. Try your hands on off-beat combinations like Watermelon and Coconut Water Drink, Watermelon and Basil Lemonade or Muskmelon Watermelon and Wheat Grass Juice and relish them. Fruit Infuser Water Bottles are easily available all over India, in online shops as well as the home section of supermarkets and retail chains. If you don’t have a Fruit Infuser Bottle, you can just use any glass jar or pitcher. Put the fruit and vegetable in the pitcher along with water and allow them to infuse for 2 to 3 hours. Kiwi Watermelon Infused Water, Watermelon Yellow Capsicum Infused Water, Watermelon Mint Ginger Infused Water are some super hydrating detox waters that will work wonders for boosting your mind. 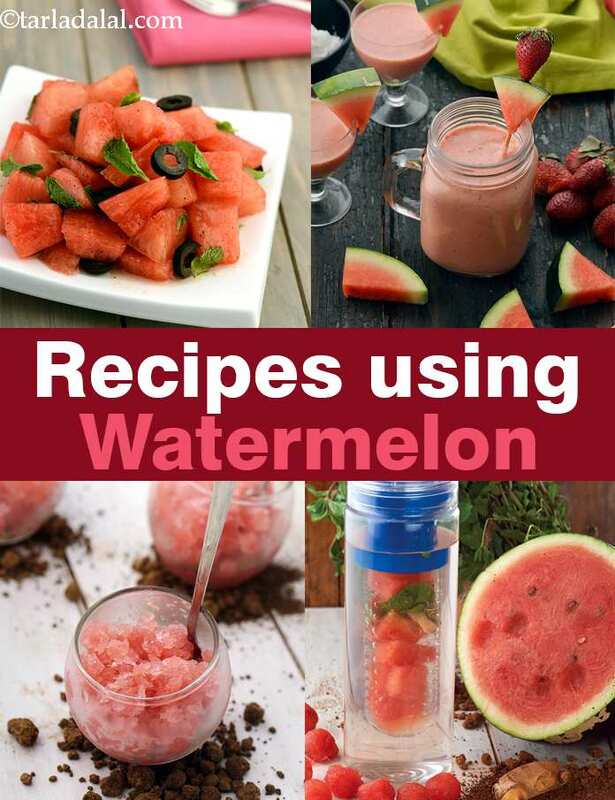 Hope you enjoyed our collection of 112 watermelon recipes. Happy Cooking! Most pediatricians advise that children below the age of i year should not be given watermelon as it disagrees with their delicate constitution. However, this is a really tasty combination of fruit juices for children over the age of 1 year and your little one is sure to enjoy it. Watermelons and strawberries complement each other in this refreshing granita. You cam also serve it as a drink if unfrozen. Watermelons are now available throughout the year, yet the tropical watermelon smoothie turns out best when the juicy, crunchy fruit is in season. The high water content of watermelon is perfectly balanced by the addition of bananas, coconut milk and ice-cream. Give your flowers a unique haven and arrange them in a basket of sweet smelling watermelon.